3500+ learn CPR - Central Wisconsin now even more heart-safe! In February, two central Wisconsin fire departments, Wausau and Stevens Point, issued a friendly challenge to see which department could train the most participants in hands-only CPR during the month of March. Their goal was 500 per department. When AED Superstore heard about the challenge we decided to champion the cause by donating manikins and other critical training supplies. AED Superstore also offered a free AED to each department if they met their goals. Not only did they meet their individual department goals, they exceeded them by a wide margin! Wausau trained 2,225, and Stevens Point trained 1,350. This means those areas now have 3,575 people trained in CPR! They also raised $4,300 and placed three AEDs in their communities. The money will support the St. Michael’s Foundation, St. Clare’s Foundation, American Heart Association, and American Red Cross. 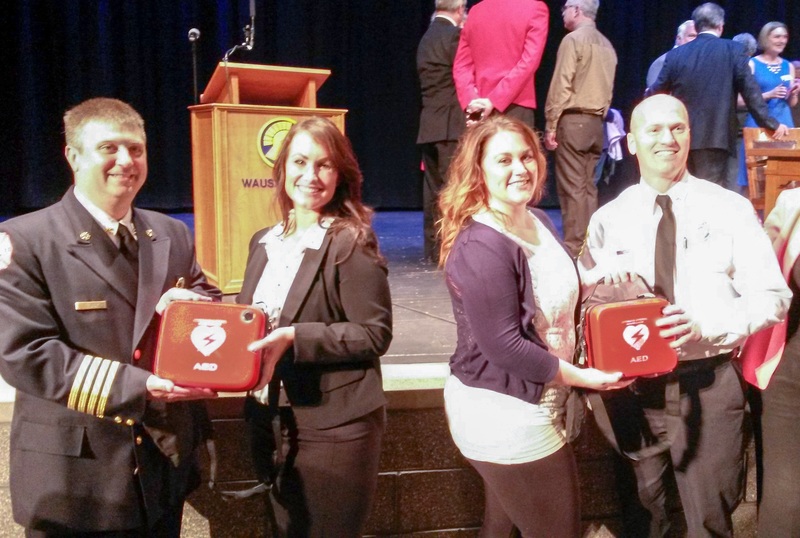 After the event, AED Superstore representatives Amber Neller and Sara Olson presented Wausau fire chief Scott Habeck and Stevens Point Fire Chief Joe Gemza with Philips HeartStart OnSite AEDs. These AEDs were, in turn, donated by the fire departments to St. Michael’s Foundation and St. Clare’s Foundation. It is very hard to get the support from Senator’s or Representatives to go forward with this movement. I am an AHA instructor and believe that all seniors should have CPR training to graduate High School. Congratulations.